To take in the culture of Hyderabad, we’ve made a list of places in the Old City where you can go to spend an entire day shopping, sight-seeing, eating as well as clicking some marvelous street shots. These famous places in Hyderabad offer an awesome glimpse of the city's diversity and hustle-bustle. Begin your day by sipping on some hot, creamy chai with delicious biscuits at Nimrah Cafe in Ghansi Bazaar. With a view of the Charminar and not too much of crowd, this little act is so peaceful and refreshing and will gear you up for the rest of the day. You can pick from different varieties of chai and biscuits, as well as choose to stand outdoors or sit indoors and spend a good one hour here, learning about the interesting history of the café too. After that chai, you can walk to this glorious monument and get some picturesque views, as well as admire the intricate architecture and pure genius in its design. You can climb the steps of Charminar for a thrilling experience and enjoy the beautiful view of the entire Old City. This will take you another hour, and it will tire you out, so we’ve got lunch next. Not too far from Charminar is this iconic restaurant where the air smells of Biryani. Die-hard fans of this place claim that the mutton biryani is to die for, and the Qubanni Ka Meetha is not to be missed. This place is always crowded, but once you find a table, you’re here for a good deal of time. For some sightseeing and a dash of royalty in your schedule, travel to Chowmahalla Palace in Motigalli (10 minutes by car) and witness true luxury. The palace was the official residence of the Nizams and houses a lot of royal items and cars which are on display for visitors. Feel like a complete tourist here, as you understand the history, architecture, and lifestyle from the Nizam’s era. This place will hold your fascination for a good 3 hours after which you can proceed for snacks. Stop by the High Court, not as a witness but as a gastronome who loves street food. Enjoy the mouthwatering jalebi and samosas with green or red chutney at High Court Ki Jalebi. We guarantee that you will come back for more, sooner or later. Once done, brace yourself for some shopping! 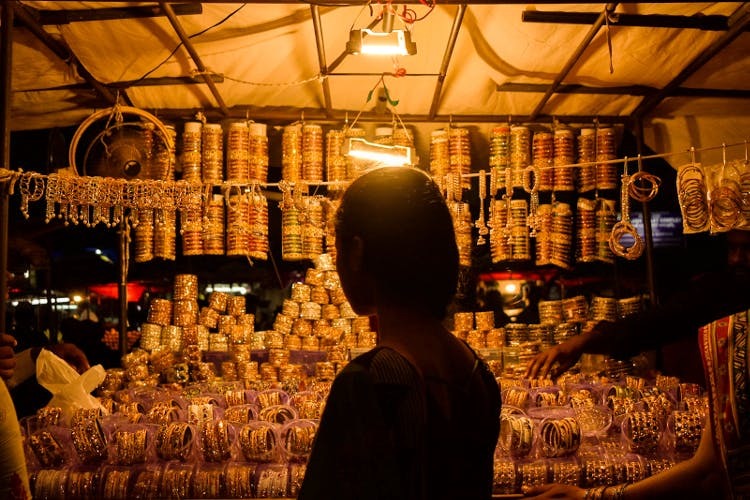 At Laad Bazaar, you can shop for the famous lacquer bangles, studded with artificial diamonds. No matter how modern your style might be, you know you need a bunch of these colourful, pretty bangles. You can also shop for more trendy items here like potlis, sling bars, desi crop jackets, and ear-rings too. Ladies, nothing can prepare you for a shopping spree quite like this one, and trust us when we say, it is an experience to cherish. This beauty of Mecca Masjid increases sevenfold during Ramadan or during the nights with all the lights, and the crowds. There is no way a day in Old City would every be complete without a visit to this grand mosque. Women may not be allowed to the prayer area, but you can still enjoy the sight and take in the air of this serene place. After an exciting day full of the best food, culture and clothes that the area has to offer, relax with some desserts and juices at Milan Juice Centre. We recommend trying out the Mulberry Salad and Avocado Juice which we so loved, to put an end to a fun-filled day.